After the excitement of receiving the invitation for the wedding of your best friend, surely all sorts of questions come to mind about what the etiquette will be like for the guests. Many people go into panic about what to wear. There are several factors to consider and that is why today we want to help you with some tips about the day wedding dresses that you can choose as well as accessories and some important details. Although it is true that normally we will have attended many more weddings during the night than during the day, no less true is that in recent years the number of wedding that are made around the noon hours have multiplied, and then continue with a great banquet and finish with a big party that lasts until the body endures in which must not miss of course the live music of an orchestra or music band hired for the occasion. DRESSES FOR DAY WEDDINGS AND SOFT TONES. One of the first things that we have to consider when we are invited to a wedding that is going to be celebrated during the day is that, unlike the night, we can not use long dresses, since this type of party dresses are reserved for the night. On the other hand, we must use half-legged dresses that are in keeping with the environment. The tone of that dress should not be too flashy. Pastel shades such as pink or blue would be the most appropriate, and of course, never a white dress, since that color is reserved for the bride. The makeup should also be consistent, so we will use light shades for our eyeshadow and for our makeup in general. As for the accessories, one of the star accessories that we can use for day weddings are headdresses of different shapes, as well as hats. We can use them with a low pickup or with loose hair. And now the ceremonies are adapted to all tastes, so we must adapt our wardrobe. For example, civil ceremonies held in the gardens of a large restaurant or on a lake have increased considerably in recent years. For these types of ceremonies, normally held during the morning, it is most appropriate for the guests to wear short semi-long dresses, since the lengths are reserved for night parties. 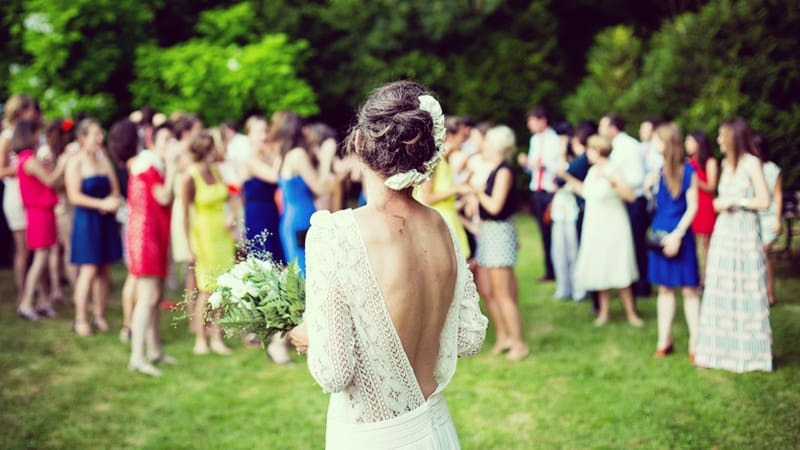 There are other types of ceremonies very widespread in recent years, and are the weddings in Ibiza, in which both the bride and groom and all guests must attend the ceremony fully dressed in white. Only the bride dresses in white. The day of the wedding is considered the time of the bride to shine in all its glory, although many people ignore many of the most essential protocol rules because they think they are outdated or obsolete. However, since you obviously do not want to overshadow the bride, it is still a good rule to follow. Even if your favorite dress, the one that looks so spectacular is white or matt white, save it for another time. Surely you do not want someone to ask you who is going to get married? Simply choose another color. Attention to details: Wide-brimmed hats are not a good idea because they can block your vision and more if they wear a gigantic gardenia, bracelets with metallic pendants that make noise with each movement are also not advisable. Unless it's a summer wedding, please put on stockings that match the tone of your skin. Take your happiest face. Some time ago I read a very good sentence that said: "You will never be completely dressed without a smile", and nothing is truer. Attending the wedding with a positive attitude and being ready to have a good time is undoubtedly essential for you and for those around you. Even if you do not feel like attending, relax and try to have the best time possible, at least for the duration of the ceremony and reception. This is a celebration, not a moment to express your negative thoughts. Leave your super-bag at home. Many girls carry all their essential elements wherever they go. However, you certainly do not want to occupy additional seats at the event venue, so opting for a smaller bag that does not take up so much space would be ideal. If you feel that you really need "all" your things, take a smaller one just for the wedding and the big one you can leave in the car that surely will not be far from you. As we are seeing, each one of the ceremonies looks for a different type of dress appropriate to each of them. Therefore when we receive the invitation for a wedding, we must pay attention to the type of ceremony to buy an appropriate model. Did you enjoy this article? 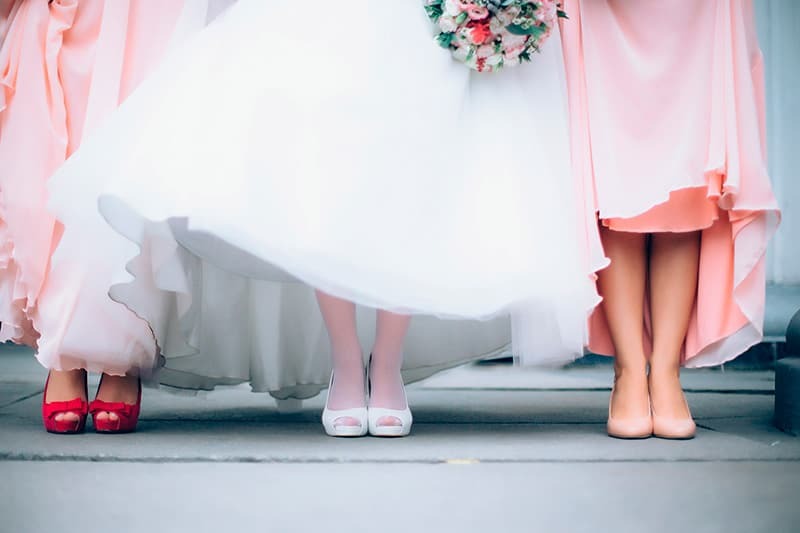 We appreciate your time and we hope we have helped you with these little tips about the options you can have regarding wedding dresses day, remember to check that your taste adapt and reflect your look. If you liked it, do not hesitate to share it on social networks with the buttons you will find below to reach more people, we also invite you to leave your comment. We hope you come back soon and we wish you a great day.